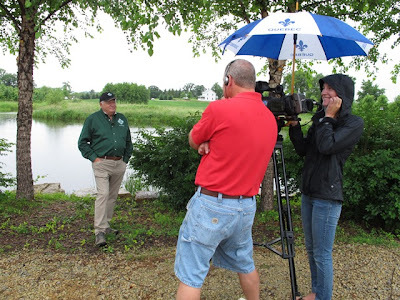 Under the Oak Tree: National Tree Farmer of the Year! 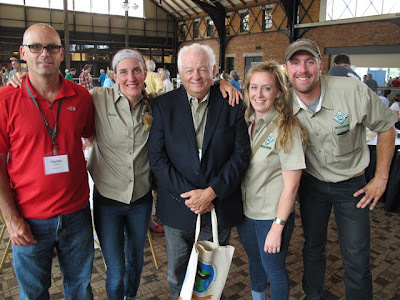 Last weekend we traveled up to Minneapolis to attend the National Tree Farm Convention. During the closing banquet we heard the announcement we've been waiting for -- Joe was named National Tree Farmer of the Year! Joe and family receive the award. This process began back in January when we found out the Wisconsin Tree Farm Committee was nominating Joe to represent Wisconsin at the Regional level. We prepared a lengthy application that included many details about how we manage the land here and all the educational outreach we've done, with lots of photos to help tell the story. In mid-March, we found out we were one of two Regional semi-finalists and judges would be visiting our Farm. The visit went well and a couple weeks later, we learned we had won the Regional award and were now one of four finalists for National Tree Farm of the Year. We quickly put together a one-page addendum to the initial application, sent it off for final consideration and voting, then crossed our fingers. Talking with the inspecting judges back in April. About a month later, we got the phone call - Joe had won the National award! It was very exciting but we weren't allowed to tell anyone - the official announcement wouldn't be made until the Convention in July. A lot of biting our tongues ensued, including the day the videographer came to the Farm to shoot our video (more on that in a future post!). A rainy day didn't stop the video shoot! Fast-forward to last weekend and finally, finally! 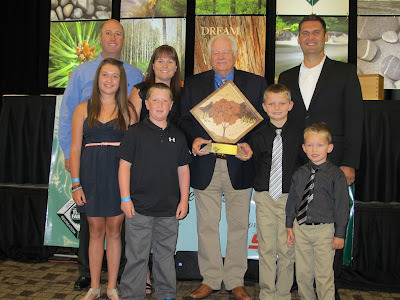 The cat was out of the bag -- Joe was the National Tree Farmer of the Year! We had a great time in Minneapolis celebrating with the Farm crew, Joe's family and many of our forestry friends. Tree Farm crew with forester Chuck Brooks. Joe will be kept busy this year, working with ATFS and AFF on promoting private woodlands. We'll also try to plan a few things here on the Farm in conjunction with the award, so stay tuned! Check out our Facebook page for more photos from the Convention!